The Monopoly Deal Card game is exciting and fast paced. While there isn’t as much strategy involved as in a chess game, there are some basic ideas and concepts that can really improve your game. The basic idea behind this strategy is to build up a hedge against the inevitable woes of the game. 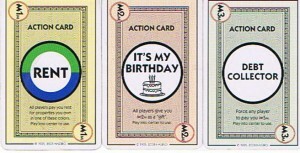 “It’s My Birthday” and “Debt Collector” played on a single turn early game can obliterate your chances of winning if you lose a bunch of property. Play money before you play property in the early game. There are exceptions, of course, which would involve playing property in order to gather rent. You are still essentially playing money, you are just doing it in a round about way. If you make a play like this, make sure that you are collecting enough rent to protect you from harm. Ideally you want 5M to 7M before playing properties. 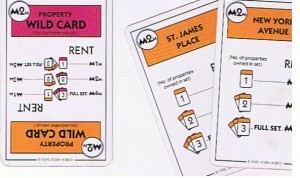 Monopoly Deal Rules state that players play “UP TO” three cards. You don’t have to play all three cards, so if playing the full three (or even one or two) puts you in a bad position, don’t do it. This might seem counterintuitive, since you need three complete sets in order to win. 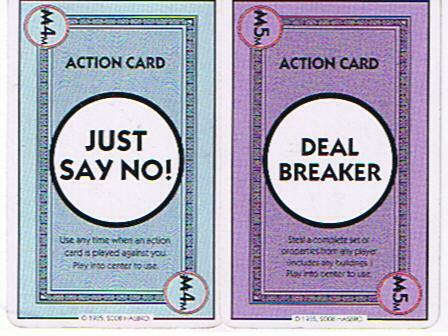 However, you have to keep “Deal Breaker” in mind. Losing an entire set in one play will almost certainly ruin your chances of winning. You can play most of a set onto the board, but withhold the completing card in your hand. Another option is to play the full set onto the board using wild cards, but to keep the set broken up by making the wild card part of a different set. 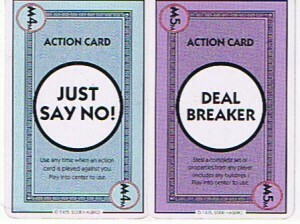 Of course, if you are holding two “Just Say No” cards, you could safely play a complete set. You’d just have to hold the JSNs for the Deal Breaker. One JSN isn’t enough, because your opponent could be holding one too. 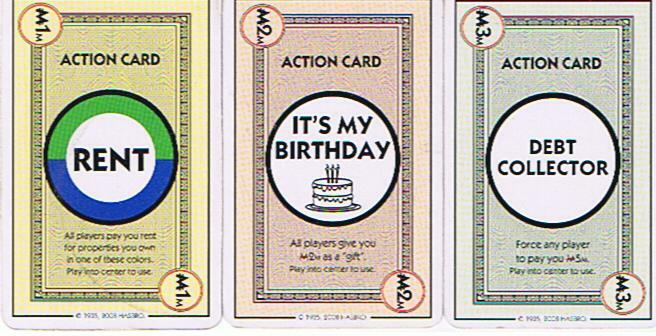 Try and play your rent cards, “Debt Collectors” and “It’s My Birthday” cards when you can acquire property. This isn’t always an option, but saving them for an opportune time can result in a devastating blow to your opponent’s game. When you are holding a JSN or two, you may be tempted to use it early when you lose a valuable property or your stack of cash. Just make sure that whenever you use your JSN it is for a game altering situation. There are sometimes points in the game where certain plays are game breaking. You can prevent those plays (or ensure they happen) if you hang onto your JSN cards. Knowing the deck can give you a significant advantage. For instance, if you know in advance that there are two Deal Breakers in the deck, and one has been played, and one is in your hand, you know that it is safe to play complete sets.